Norway’s military intelligence unit (E-tjenesten) delivered its annual evaluation of national security on Monday, and pointed to the same largest threat as the state’s police intelligence unit did last week: spying by foreign countries, with China and Russia as the most active. 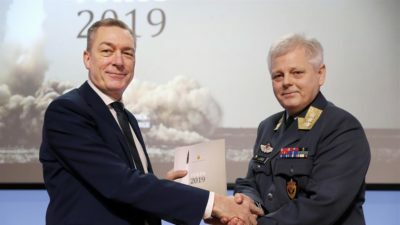 Lt General Morten Haga Lunde, head of the agency formally known as Etterretnings-tjenesten, said that China and Russia both want more insight into Norwegian defense policy and military infrastructure. The security threat assessment comes just a week after the state police intelligence service PST (Politiets sikkerhetstjeneste) arrived at the same conclusion. PST specifically warned Norwegian companies against working with the huge Chinese technology firm Huawei, which prompted a sharp response from the Chinese Embassy in Oslo. Just two days after that, large Norwegian technology and financial services firm Visma confirmed that it had been the target of an “advanced” hacking attack last fall, and that the US security firms it hired to help investigate the attack pointed to Chinese hackers that they believe are backed by the government in Beijing. The embassy also scoffed at those allegations. Lunde said there’s also been “activity” against military and political targets in Norway, against Norwegian industry and the Norwegian health care sector. Some of the activity against the military took place during NATO’s large Trident Juncture exercise last fall, when Norway’s defense department registered GPS jamming that affected Norwegian and allies’ flights. E-tjenesten‘s report comes after a Norwegian citizen, meanwhile, has been languishing in a Moscow jail for more than a year, accused of acting as a courier for Norwegian spies. Frode Berg, a retired border inspector from Kirkenes in Northern Norway, is still waiting for his trial to come up and has said he fears he was “duped” into working for E-tjenesten. The intelligence agency has declined comment as has the Norwegian government. 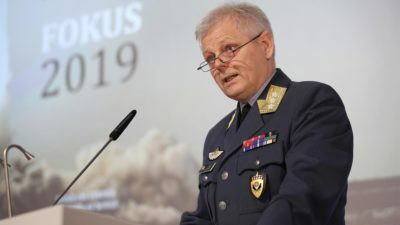 It was represented at Monday’s intelligence briefing by Defense Minister Frank Bakke-Jensen, who claimed that developments within security politics are causing great concern. Lunde told Norwegian Broadcasting (NRK) that he was “worried about Russia’s methods … and the type of signaling tied to GPS-jamming that has especially and seriously affected civilian life in Finnmark.” Several commercial flights have lost their GPS signals while airborne, while civilian residents in remote locations have also experienced loss of GPS signals, which can generate dangerous situations in the event of injury or other emergencies. Lunde otherwise described the terror threat facing Norway as “complicated and unclear” as the terrorist group ISIL becomes “steadily weaker.” Other groups can emerge, however, and ISIL’s ideology is shared by Islamic extremists around the world. Several extremists will also be released from European prisons next year, he noted, and that can make the terror threat they may still pose more complex.